It’s been seven years, almost to the day, since I absconded to Italy. Rash, wayward and troubling it may have been, but my departure in March 2005 was, and remains, one of the better decisions of my life. After all, if I hadn’t come to Italy I might never have discovered (that amongst other things) I like, with a certain passion, courgettes. Which are zucchini to many of you, and indeed me after seven years. It wasn’t that I disliked zucchini before arriving in Italy! Dislike suggests strong feelings, judgment and an opinion, whereas my feelings about the tubular baby marrow Cucurbita pepo were – like football, most gadgets, inner soles and Celine Dion – those of indifference. I’d spied vast, tumbling heaps of zucchini – most a familiar forest green either shaped like baby zeppelins or stout grenades, some bright yellow, others golden, many a seductive pale green – at markets on my chaotic travels round southern Italy and Sicily, most notably at the notorious and fascinating La Vuccaria market in Palermo. 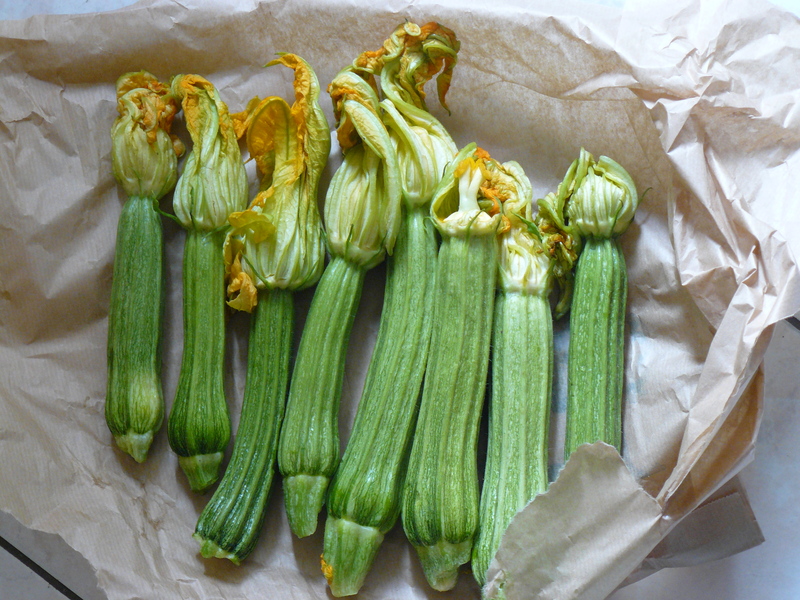 But it wasn’t until I arrived in Rome, settled comfortably in Testaccio and began going to the Market each day that I really took note, particularly the striking zucchine romanesche. Zucchine romanesche are pale creamy-green mottled with white. They are slim, elegant things that often curve this way and that and are fluted like the Corinthian columns inside the Pantheon. If they are properly fresh they come crowned with a golden headdress, a fragile, rich-yellow flame-like flower. Their creamy white flesh is compact with tiny seeds, sweetly tender, seemingly the collision of a good cucumber, the sweet stem of brocoli, a piece of pumpkin and yellow melon. When cooked, the flesh is even more delicious, tender, sweet – but undeniably savory – and beguilingly creamy. My zucchini indifference was short-lived once I settled in Rome. Romans prize their zucchini especially zucchine romanesche and do marvelous things with them. Cut into rounds, slices, diced or grated they are sautéed lightly in olive oil until tender and served just so or used as a sauce for pasta. Fat match sticks of zucchini are dipped in batter or flour and then fried until tantalizingly crisp in hot oil and served like potato chips in waxed paper bags, a clandestine snack best eaten with your fingers: soon shiny with oil, while walking in the sun along via Galvani. Zucchini are grilled, baked, braised, make a fitting filling for a frittata or ideal ingredient in risotto. Long thin strips are roasted and charred on a griddle pan then left to lounge in olive oil with fresh basil leaves before being served as an antipasti. At many of our lunches at Volpetti Alice and I have eaten zucchini stewed gently with fresh tomatoes and basil, mopping up the juices with crusty bread. Left whole, zucchini are stuffed with seasoned meat or breadcrumbs and then baked, or better still, braised in tomato sauce. Small, particularly tender specimens are boiled or steamed and then served with good olive oil, salt and maybe a little lemon juice or sliced as thin as paper and the tucked in warm pizza bianca with mozzarella. Thinly sliced zucchini are also dressed with oil and lemon and served as a salad. And then there are the flowers, i fiori di zucca. I fell for the flowers first, beautiful to look upon but even better to eat: torn into a salad, snipped into an omelette, stuffed with ricotta or best of all, with mozzarella and anchovy, dipped in batter and then fried until crisp and golden in very hot oil and eaten while tongue scaldingly hot with a glass of prosecco. 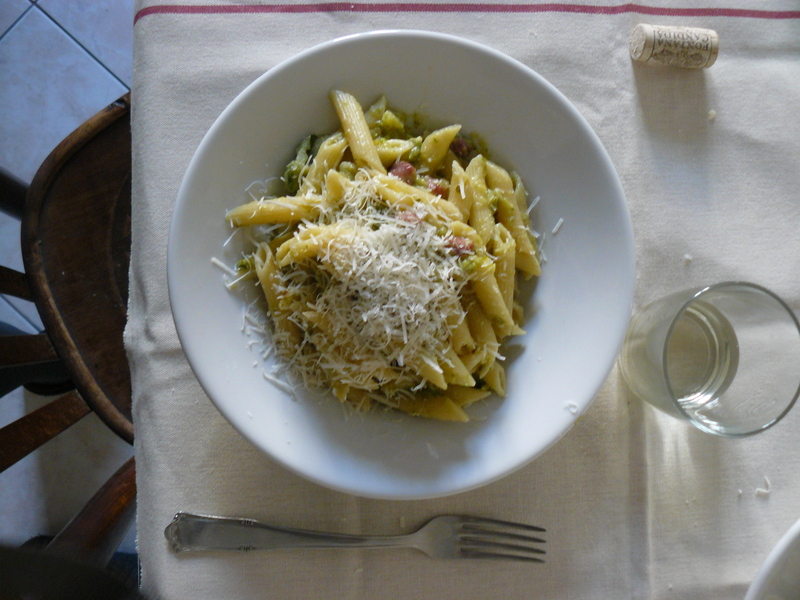 Having fallen for its charms, I took to cooking zucchini with a degree of over enthusiasm which is well documented here, in a kind of cabonara, Fusilli with courgettes, Frittata, Fiori di zucca, and now this Pasta con salsa di zucchini e pancetta – Pasta with courgette sauce and bacon. A particularly clumsy name in English I know, but don’t let that deter you. 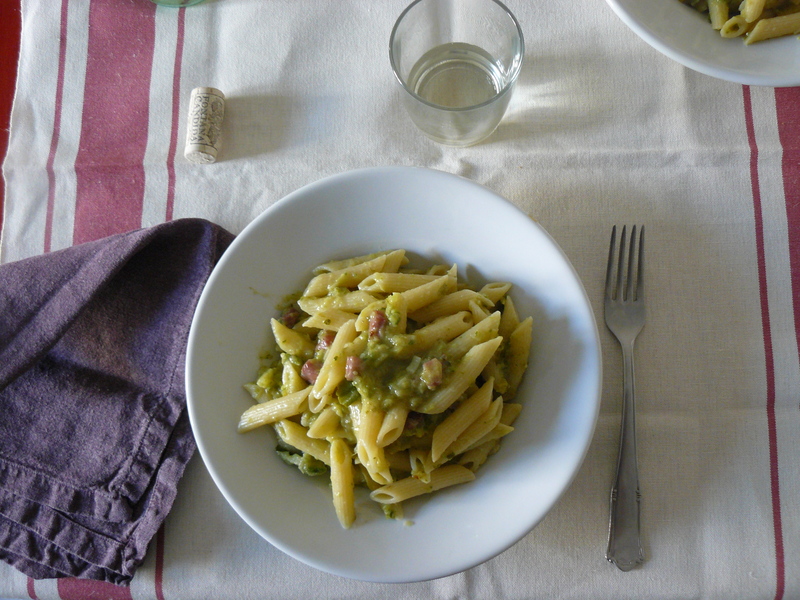 This recipe has much in common with both Fusilli with courgettes and another of my favorites, a weekly lunch and fixed point in my otherwise chaotic routine: pasta e broccoli. Like broccoli, zucchini when cooked until extremely tender in garlic infused olive oil – collapse, and with a little assistance from a fork, potato masher or cautious blitz with an immersion blender, create a soft creamy sauce for the pasta. This sauce also happens to be my favorite colour. I am very happy to eat my pasta wearing just a green coat. The pasta that is, not me, unfortunately I don’t possess a green coat. But lunch is even more delicious when the green sauce is dotted with some diced pancetta or prosciutto that has been fried until tantalizingly crisp: the salty pork giving a kick to the good but undeniably mild and gentle (arguably insipid if not seasoned correctly) zucchini sauce. This recipe, like so many of the nicest everyday pastas is pleasingly straightforward to make, but depends on good ingredients: nice olive oil, plump garlic and young, fresh zucchini are key. You could, as with pasta and broccoli, boil or steam the zucchini until soft, drain them and then finish them off in a frying pan with olive oil and garlic before mashing them. However as zucchini have a tendency to become water-logged and soggy especially when boiled, I think it’s best that you cook the zucchini in a frying pan, first with oil and butter before adding a little wine and water, This way the zucchini half fry/half braise and by the end of the cooking time are beautifully tender and much of the excess water has evaporated away. I use an immersion blender – cautiously – to reduce the zucchini to a creamy sauce, but if you prefer a coarser more textured sauce I suggest using a fork. Is there anything else I need to tell you? Probably, but this post is already far too long for such a simple recipe and my son is eating the computer cable. True to the Oxford English dictionary, my roots and as so as not to confuse my brother, I have referred to zucchini as courgettes in the recipe below. Best served with a glass of white wine obviously. Wash the courgettes thoroughly in cold water. Drain them, trim away both ends (saving the flowers!) 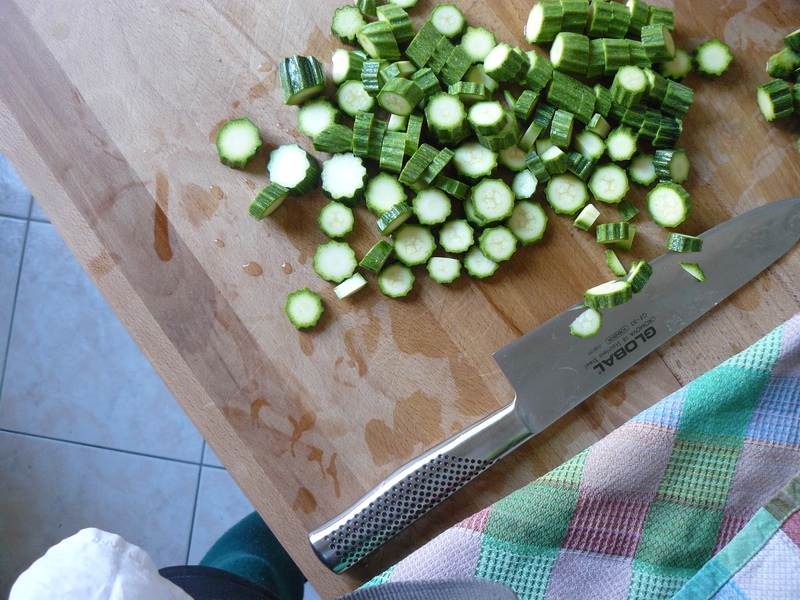 and cut the courgettes into rounds a little less than a cm thick and pat them dry. Warm the oil and butter in a heavy based frying pan over a medium-low flame. Peel the garlic then squash each clove with back of a knife, add to the frying pan and sauté gently until the garlic is fragrant and just – but only just – starting to colour. Add the courgettes and a pinch of salt to the pan, moving and turning them so each piece is coated with oil and butter. Bring a large pan of well salted water to a fast boil and add the pasta. Tip the courgettes into a bowl – remove the garlic if you like – and then using a fork, potato masher or immersion blender (cautiously) mash the courgettes into a rough sauce. Dice the pancetta.I n the frying pan you cooked the courgettes in, warm the oil and then fry the pancetta until it is crisp. Add the courgette sauce to the pancetta, stir, check seasoning. When the pasta is al dente, drain – reserving a little of the cooking water – and tip into the pan with sauce. Toss the pasta and sauce together adding a little of the reserved cooking water if you think the sauce needs loosening. Serve immediately with plenty of freshly grated parmesan. This sounds absurdly, wonderfully delicious, and something I can’t wait to make. Here in San Francisco it isn’t quite zucchini season, but soon enough! Your description of the battered and stuffed blossoms make me very wistful for Rome, and all things fried and wrapped in a square of thin paper. Thank you! ….all things fried and wrapped in a square of thin paper – they are the secret to a happy life I think. You make moving to Italy sound like a grand idea! 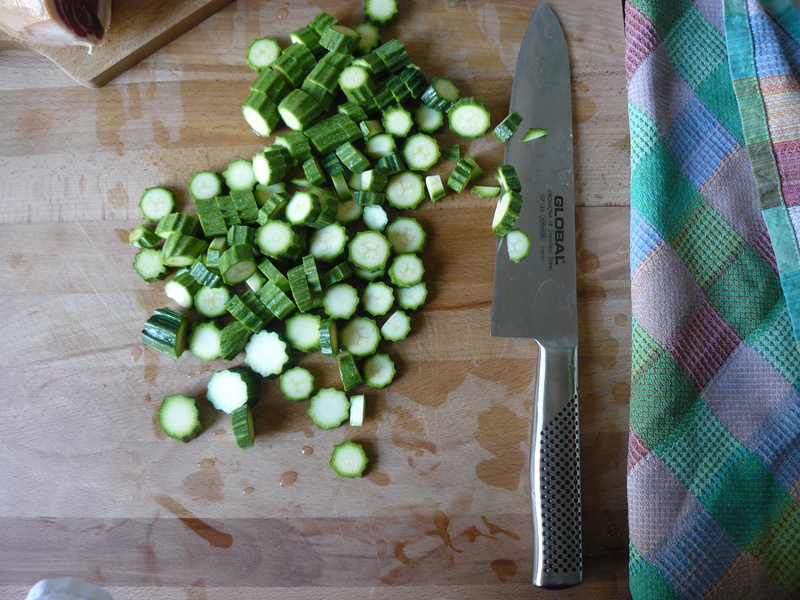 Great post, I was a lover of zucchini before I read it, and you made me yearn for summer weather over here in the states. Can’t wait for our fresh zucchini to start arriving at the markets (and for our markets to start opening as well!). After the initial chaos – very good. Here’s speeding spring along to you. The courgettes with flowers attached are so pretty! I fell in love with zucchini last year, my first year gardening. I loved how easy they were to grow, and celebrated their bounty as other crops failed due to my naiveté. I will gladly eat a bowl of pasta cloaked in green! Love this recipe! I’m definitely going to add it to my zucchini repertoire. I love the teeny tiny baby zucchini that are showing up in the market these days, don’t you? Gosh I always feel very proud when you comment Elizabeth! looking forward to seeing you when Mona comes! Yes the tiny ones are exquisite. I am off to Rome in two weeks for a trip inspired in no small part by reading your lovely stories over the past two years. Thank you for all the food for thought (and tummy). That is so nice to hear and the highest compliment I think. Have a look at Katie Parla http://www.parlafood.com/ and Elisabeth Minchilli’s http://www.elizabethminchilli.com/Home.html blogs for more Rome inspiration. Come and visit testaccio. Have a fantastic trip. Pasta with broccoli is a staple in our house. Now that we are easing into the summer, I am definitely going to try this recipe as a variation. I don’t use zucchini enough! 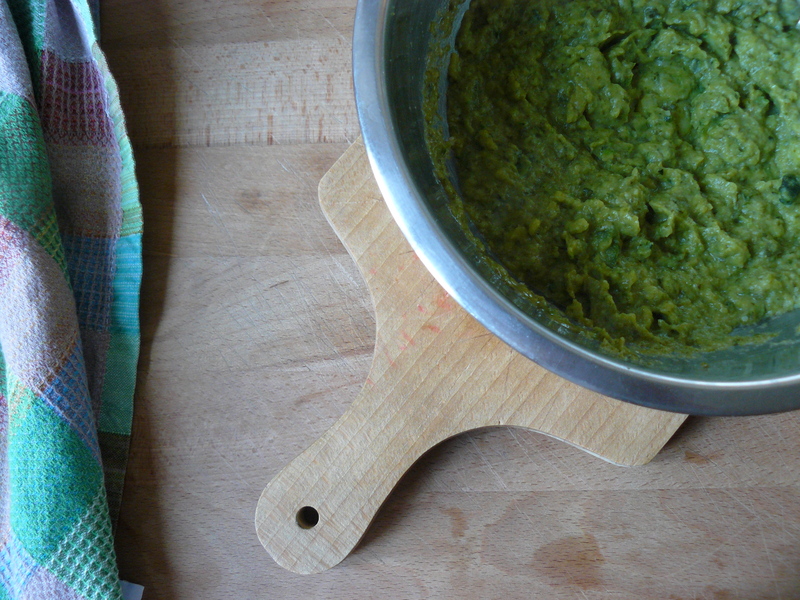 Hi Carrie – If you like pasta with broccoli, I think you will really like this. The key is cooking the zucchini until they are really soft and also allowing some (but not all) of the the water to evaporate away. If you know about cooking pasta and brocolli though and that collapsing/creamy moment this recipe is pretty easy! Costada Romanesca are my favorite summer squash to grow, we can never get enough! Thank-you for this inspired way to preparing them. Is that their proper name – fantastic – Costada Romanesca: I like it. One day maybe, just maybe I will have a garden and will grow them too. It did cross my mind that most places are still a while away form zucchini! It is a good recipe to have tucked away though! Yes yes yes, this is just my kind of pleasingly straightforward. One of my fondest childhood memories is eating freshly picked zucchini stewed with tomatoes and basil. Each time I so much as smell it, I’m transported back to my grandmother’s summertime kitchen table. Your pasta recipe sounds fabulous. What a delicious sounding memory! And as I mentioned, zucchini stewed with tomatoes and basil (and plenty of oil and salt) is one of my favorite ways to eat zucchini too. Whjen you come to Rome we will have to try it at volpetti. I might not quite reach the food memory heights of your grandmother’s dish but it is pretty delicious. Mmmm looks delicous! Zucchini season has not quite started where I am but when it does I will surely refer back to this recipe. Another lovely and inspirational post. Thank you so much. Love your writing and your photos and enjoy seeing the photos of Luca as he grows bonnier and bonnier (and busier and busier!). Oh yes, so busy these days what with all the shouting and banging and waking up at 5 in the morning. 6 months is a lovely age though. It is very nice to be told you are inspiring! Your pasta looks so yummy and springlike. Oh…to be in Italy in the Spring! It is pretty Lovely in Rome these days (even though for some reason spring always brings on nostalgia for London) and yes, this is a proper spring pasta. It would be good with some peas too i think. Beautiful beautiful. Your love affair with zucchini makes for a nice frame to your Italian history. I remember waiting for what seemed like hours as an Italian flatmate simmered cauliflower, shimmering in olive oil, until it collapsed into sauce. That kind of hungry impatience is worth gold. Thanks for the recipe and have a great day! Happy Spring, and Happy 7th, Rach–I have tried to grow those Italian heirloom zucchinis (zukes! we call ’em) a variety called cocozelle, striped like your romanescas–gorgeous plants that bore few squash–but the ones that I did harvest were superb. i love zucchini you have a great website and i will try this recipe your so luchy living in italy. i used to spend alot of time in santorini and greece during the 1980s but didnt get to italy. rachel do they have aany american style bbq there? Courgettes and garlic have always been a healthy staple in our house – and to add some beautiful pancetta and serve with pasta seems inspired. We were married in Capri and used to go to Italy from the UK at least 8 times a year, mainly Puglia and the south. We desperately miss it now we live in Canada, but love your blog! Looking forward to trying this recipe this week. “like football, most gadgets, inner soles and Celine Dion…” i got a good giggle out of that one. always with the brilliant writing, you. I’ve made your “kind of carbonara” many times and the fusilli with butter etc. as well. Love both of them, and can’t wait to try this one. great blog you have…makes me wanna take a plane to rome! i do something quite simillar to your recipe,first blanching the zuccini al-dante,then saute them with some olive oil and a whole clove of garlic,for 3-4 min’.then mushing it(without the garlic) with some fresh ricotta,sometimes a bit of double-cream added..and adding it to the pasta(i do the same with spinach).now i will try your way instead of blanching…the ricotta is added in order to make it less vegie to my youngest. Think I going to have a courgette weekend having made the ‘courgette kind of carbonara’ tonight and planning on making this dish tomorrow. I make something quite similar but where I coursely grate the courgettes first, sauté them, then add king prawns, instead of the pancetta with a pinch of chilli. The wine is added and reduced. And occasionally if the mood takes me I add a few cubes of taleggio (my daughter’s favourite) or a few cubes of dolcelatte (my husbands favourite) right at the end with the reserved starchy pasta water. Making this right now. I’m using cavatappi and my squash is yellow crookneck. I hope I’m not breaking too many Italian rules. Dear Rachel you cook the way i love to eat – i will be making this!!! i have spent all afternoon “devoting your blog”!! your writing & recipe skills are inspiring – thank you. Pots and Puntarelle: a one-off tour of Testaccio with Agnes Crawford and Rachel Roddy on Wednesday 6th December. half tbsp, two classes, a dinner and 6 lines. 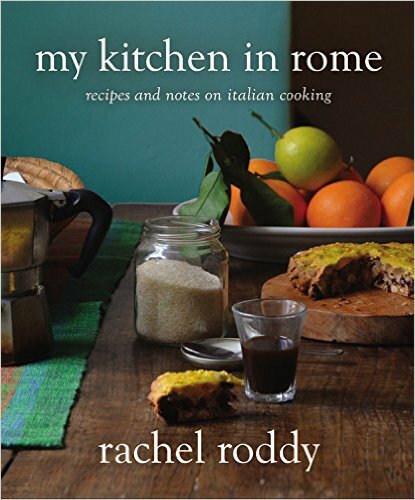 rachel eats · stories, pictures and cooking tales from an english woman living in rome.